of interesting halo displays observed around the World. It seems putting the photos of the recent displays to my web page will delay. So, in a meanwhile here are two more photos of the display three weeks back. When light source is at 0° elevation, some difficulties arises in identifying certain halos. Tricker arc and subanthelic arc merge together, as do helic and subhelic arcs. However, the subanthelic arc is formed by Parry-oriented crystals, while Tricker arc is from singly oriented columns. Because in this display the 46° supralateral arc is rather strong, and there are only weak indications of 46° Parry or Tape arcs, probably singly oriented columns were in command. The even brightness of the Tricker/subanthelic loop is also typical for Tricker arc. Subanthelic arc has strong brightenings on the sides - at least in the simulations - and that is actually what seems to be present in the the display of last weekend. 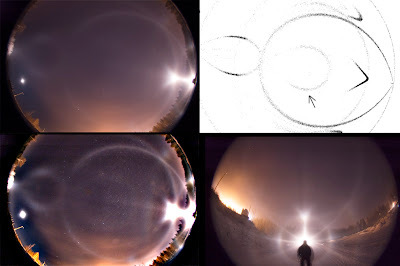 The reason why halos are seen so strongly in the halogen light is probably the relatively dark background sky as compared to sun or moon situation. Yet all the halogen lamp displays that I have photographed so far have been hampered by city lights. Once the crystal cloud drifts to the dark outskirts of the city, more intense appearances should be expected. The lower left photo shows what was seen around the half moon at its best. For long time there was hardly no moon halo, although in the beam of the halogen torch a great display was present. Some indication of Lowitz arcs is present in the moon photo. The crystal sample may be representative of this stage, but I am not sure. A bright halogen spotlight and diamond dust is a magic combination. Spot yourself exactly in the middle of the beam and breathtaking halo views may rewards you. An outsider will see just somebody bathing in the light and may wonder what is going on. There might be a Moon in the sky at the same time - like in the case shown here - but it shows hardly no halos at all. The lamp creates its own universe of halos. 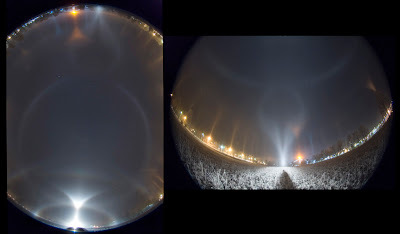 The Ounasvaara snow guns created this display last night in Rovaniemi in the beam of a Cyclops Thor Platinum X-15 halogen lamp. Because of the lack of 46° lateral arcs, this display must have been dominated by Parry crystals. Indeed, in the lower right image there are both upper and lower Tape arcs as an indication of Parry orientation. An interesting feature is seen in the images on left (the lower image is an unsharp masked from the upper). There seems to be a loop inside the helic arc. Much like the loop formed by the subanthelic arc. On the upper right is a simulation that shows a quite similar loop (arrow). The crystals in simulation are Parry oriented and they are semitriangular, a half way between a triangle and regular hexagon. The thing in the photo looks to me like a halo and it might be the one shown in the simulation. I have not raytraced it, so I don't know what it might be called. There are some differences in the loop sizes between the simulation and the photos, but then again the projections are not exatly the same. A bit more could be said about the results of the last night, but this must do for now. The simulation was made with a program by Jukka Ruoskanen. 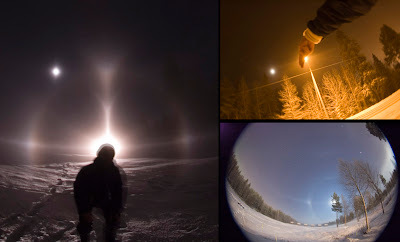 Have you observed a halo display? Do you have halo photos that you think might interest others? Send us a sample.